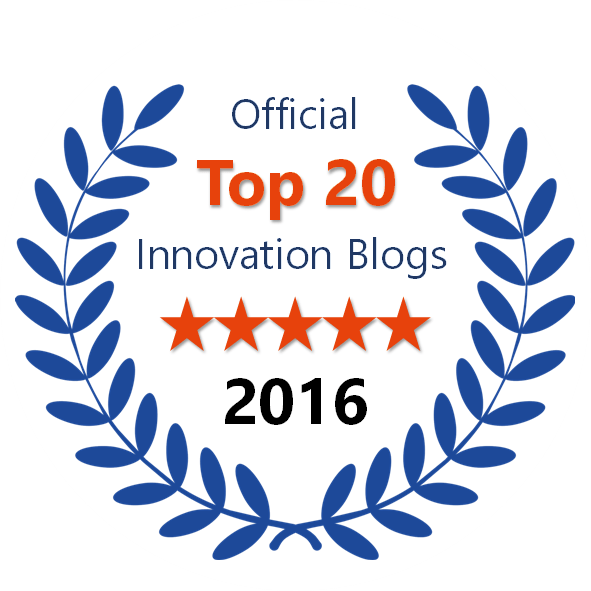 This is part two of a two-parts article co-written with Kevin McFarthing from Innovation Fixer. The first part can be found here. In our previous post, we discussed how Strategic Portfolio Management (SPM) ensures that the content of the portfolio is driven by innovation strategy and associated targets. 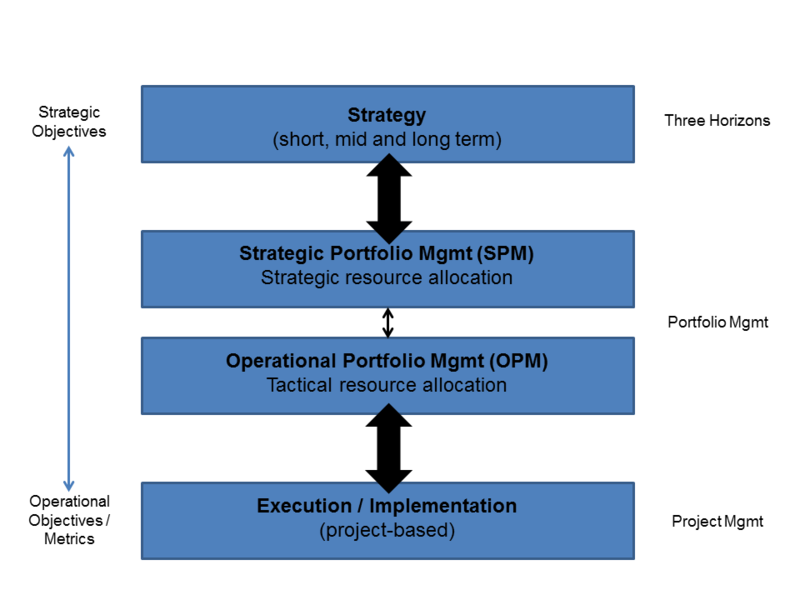 We would now like to move on to Operational Portfolio Management (OPM), where the portfolio directs resource allocation, metrics and reporting on an operational and tactical level. The link between the two is shown in figure 1 below. 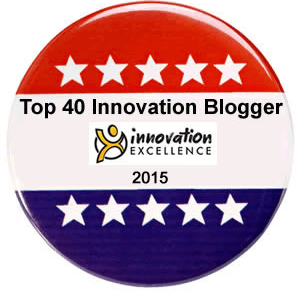 Innovation portfolio management is more than a visual representation of a project list. It should be a system, a way of managing a group of projects that delivers innovation to the market. 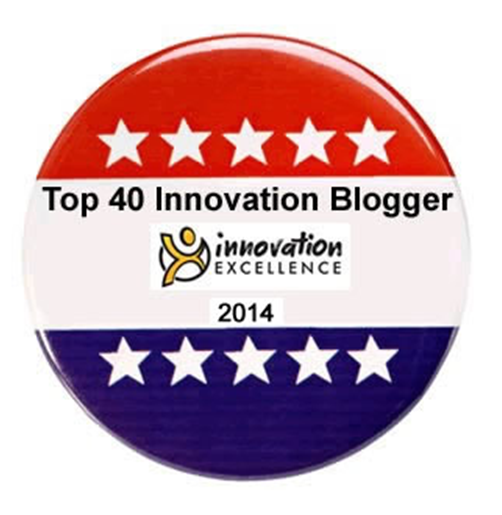 OPM covers the implementation of the innovation strategy. There are other key elements in innovation management such as Stage/Gate, project management and governance; but the portfolio pulls everything together to ensure that what actually happens in practice is aligned with the strategic intent. Without successful execution, strategically aligned portfolios stay as well thought out documents. OPM converts purpose into a plan. It helps a company implement the current portfolio and to carry out multi-project management efficiently. Every department, geographical business or other organizational element involved in a number of innovation projects needs to allocate resource to deliver its obligations. OPM functions as a dashboard, enabling integrated planning and tactical resource allocation, balancing hard and soft skills across project requirements. Furthermore, OPM allows management of interdependencies across on-going projects, maximizing efficiency across the entire innovation portfolio. Different groups will be involved in projects at different times. For example it will be unusual for R&D and Sales to have the same intensity of activity on a project throughout its duration. OPM enables individual departments to plan the activities for which they are responsible, allocating their resources appropriately, and delivering on their commitments. Whilst each group develops their own plans, they should be careful not to establish divergent project portfolios. Much of innovation is about exploring the new and original. It is therefore important to build space in both SPM and OPM for tests and experiments. These projects may have different content, team composition and metrics. The temptation to build uniform systems may inhibit the appropriate priority for experiments. At the SPM level, a Three Horizons approach can determine the proportion of resource available for experiments. It is the role of OPM to ensure this is followed through in practice. Most innovation project portfolios are a complex arrangement of dynamic change incorporating multiple interrelationships. It never stands still so good OPM is essential to ensure not only delivery of the projects, but also efficient use of resource in doing so. The implementation of OPM rarely starts with a blank sheet of paper or an empty spreadsheet. Every company will have existing strategies and a portfolio of projects. However following major strategic or operational reviews there will be the need to review the operational elements of portfolio management from the start. The key sequence in the implementation of OPM should be analyse/involve/align/execute, as outlined below. 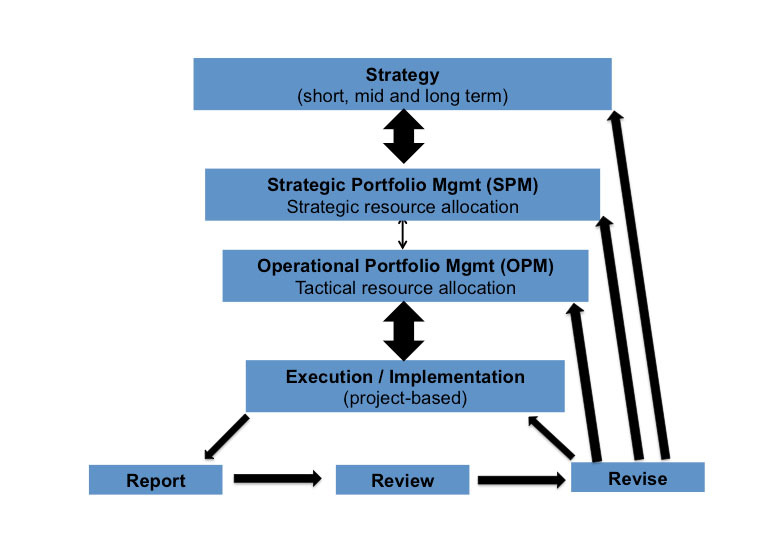 The strategic intent, targets and project priorities should be clear from the SPM cycle. There will still be much work to do to translate these into a plan; it needs a combination of analysis, IT and – most of all – communication. It should be a people-driven process, with each resource group providing input to the master output of SPM and identifying opportunities to improve, as well as areas of potential resource conflict. Active engagement of all groups is critical, as passive acceptance usually leads to lower motivation. Each department should be involved in establishing the requirements at both the project and portfolio level. Usually several iterations will be needed before an integrated portfolio plan is reached and subsequently each group can then commit to the overall innovation plan. Equally it’s important not to aim for total consensus in this phase; somebody will need to ensure that the necessary compromises are reached and decisions are made so the process isn’t bogged down. Finally, a workable plan will be reached, and while it may be tempting to continually finesse the detail, action and implementation are needed to turn it into reality so the “go” button must be pressed. OPM can become a beast, an unwieldy mound of data apparently impossible to interpret. If it can’t be understood it can’t be used, so unofficial offshoots may arise to make it practical. That’s why an important rule of OPM is to do all within your power to make the system agile, relevant and not bureaucratic; and to obviate the need for alternative management tools and to deviate from a single source of the truth. If the world is changing rapidly but your OPM can’t adapt, it will be a contributor to corporate demise. The governance of SPM and OPM is a fundamental part of the system. It should be clear who decides what, and when. Some companies build complicated matrices to clarify RACI (responsible, accountable, consult, inform). There is a danger that too much precision in process diminishes the ability of managers and teams to do the right thing and keep projects moving. Our recommendation is to establish a Portfolio Management Board (PMB) that is responsible for making strategic decisions and major ones concerning implementation, prioritisation and resource. Managers should then be encouraged to use their common sense. Successful OPM is very difficult without a Portfolio and Project Management (PPM) position, reporting to the C-level. Any large business needs a “go to” person who is the centre of the OPM universe. They should define standards, systems, reports, timetables and be both PPM leader and helper. They should ensure the single source of the portfolio truth. All good management systems are founded on metrics, in the sound belief that what gets measured gets done. The principle is the same with OPM, where the portfolio is the primary source of information for the innovation dashboard and which should follow some simple rules. Each business should develop its own metrics, recommendations for which can be found in articles by Mario Trentim, BCG and the Book of Metrics. As mentioned in Part 1, metrics vary considerably across the different strategic time horizons. Decisions will be made on the basis of portfolio reports. It can be very tempting to produce large PowerPoint decks full of beautiful diagrams, slicing data in many different ways. Of course the reports should look good; but the true value lies in the quality and clarity. It’s not a bad idea to put a limit on the size of the report, forcing decisions on what is really important, especially when spurious data requests threaten to overwhelm and “bureaucratize” the system. OPM reviews should be at a frequency appropriate for the nature of the business and the length of the product development cycle. If it takes three months to develop a product from idea to launch, six-monthly reviews are unacceptable. In addition to metrics, it’s important to evaluate information such as the innovation “calendar” of projected launch dates, evaluating the use of backup projects for important options which may be in danger of failing. The portfolio can also be used to raise “Red Flag” warnings of major project plan variances, resource clashes or strategic misalignment. OPM experience should inform decisions on portfolio priorities in SPM. This should involve some discomfort when killing projects; as Bob Cooper puts it “you need to drown some puppies”. The Zombie projects should also be killed and not resource in OPM. Decision clarity on a simple framework of Go/Hold/Kill should be used, with criteria for each status; but to inform a decision, not to dictate it. Ideally prioritization should be done in project groups, e.g. high/medium/low to minimize OPM complexity. Anything not resourced should not appear on the list, otherwise “project illusion” starts to creep in, building false expectations. Even if all your projects are resourced to some extent, it is also advisable to make sure the appropriate focus and resource intensity are on the most important projects. During the tactical resource management process, project plans are steadily synchronized with resource availability. This ensures that individual skills are balanced across project requirements. As figure 2 above shows, some revision of the portfolio plan will be necessary. It is most likely to be adjustments to the execution of projects, then tactical resource allocation. Given that most strategic resource allocation should be robust, regular review is likely to change less, but the ability to do so is necessary as flexibility and rapid response are essential. Finally changes to strategy may be required to pursue a new opportunity or to respond to a new threat. The complexity of most project portfolios will inevitably lead to the need for IT support in the form of a Project and Portfolio Management (PPM) system. PPM systems can be as simple or complicated as you make them, but our advice is to stick to the principles outlined above and ensure the system is appropriate to your needs. One guideline is to use a package that works with your OPM, not the other way round. You shouldn’t have to adapt your methods to the software. Suitable systems include Microsoft Project, Kalypso, Planview and Flightmap. Microsoft Excel can also be adapted. Once a system has been chosen, it is crucial to train users in the whole OPM approach as well as the IT; understanding software menus is just a part. There is often a gulf between strategy and what happens on the ground. The integration of SPM and OPM narrows the gap and ensures alignment, optimum resource allocation and ultimately the successful implementation of great ideas. Keeping the system agile and flexible will enable rapid implementation of opportunities and response to threats. IT support should be as simple as you can make it. Innovation Portfolio Management at the Strategic and Operational level can be the pivotal tool for business growth. This article was first published at InnovationManagement.se.